create a fun way for yourselves and your family members to collaborate on a guest list. 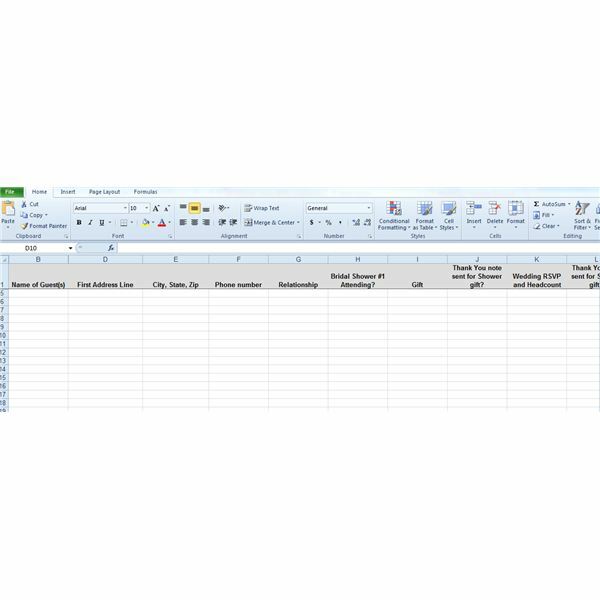 Perhaps you prefer a simple Excel spreadsheet to document prospective guests; use it later to generate a merge doc for mailing labels. Either of these tools allows you to track your shower and wedding gifts and thank you notes, reception meal choices and seating, plus more. Speaking of thank-you notes, be certain to write yours within the time frame dictated by etiquette. If you receive a gift from someone who you know will not attend the wedding, your note should go out within two weeks of receipt of the gift. People who attend the wedding must be thanked within two months of your wedding day—or you’ll turn into an unappreciative cretin! Avoid humdrum repetition in your notes by exploring interesting, thoughtful ways to express your thanks. engagement party takes place pretty much whenever you like after the two of you announce your plans. Save-the-dates are mailed six to eight months before the wedding. Considering the busy schedules people have today, save-the-dates will provide a reminder for family and friends to list your wedding on whatever calendar (electronic or not!) they use. Before you know it your bridesmaids will be planning your bridal shower! Typically the shower is held two to three months before the wedding. Pass along these ideas on putting the right touches to shower invitations using Publisher—along with catchy wording to get guests' moods soaring. 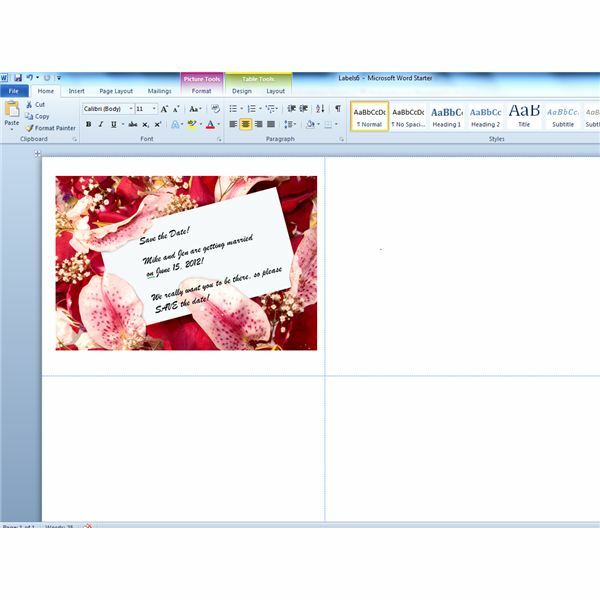 If you feel better using Word, pick up one of the package templates available in your local office store and let your creative juices flow. couple reasons. You are less likely to save money with DIY invitations, because for a quality result it doesn't pay to skimp on the paper you choose. It’s also vital to have a good printer at hand, and you should plan on using plenty of ink. However, as mentioned earlier, your own invitations allow you freedom of expression and follow-through with a specific pattern or design. 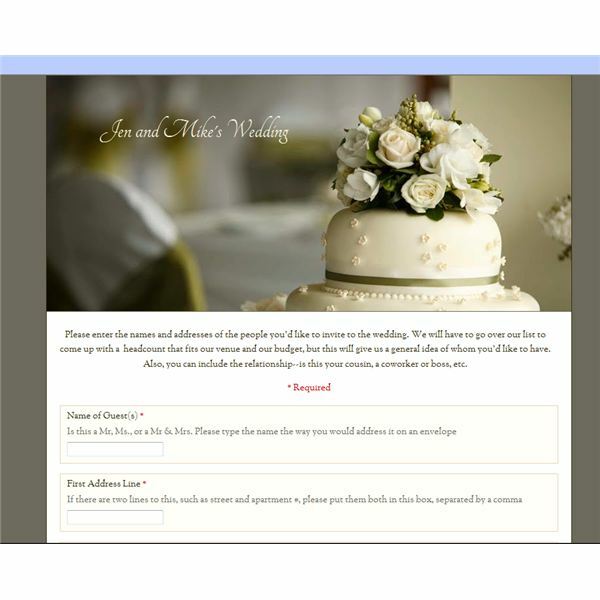 You can seek guidance using a popular invitation product or tackle the stark challenge of beginning from scratch with Photoshop or Word. Stylize your wedding with a specific theme that fits the two of you. Consider these ideas for themes, from winter and winter holiday to a beach event to a Halloween affair. You might prefer a Christian ceremony or enjoy a romantic, renaissance, or fairytale theme. Use themed accessories to decorate your reception hall to carry through your ideas. 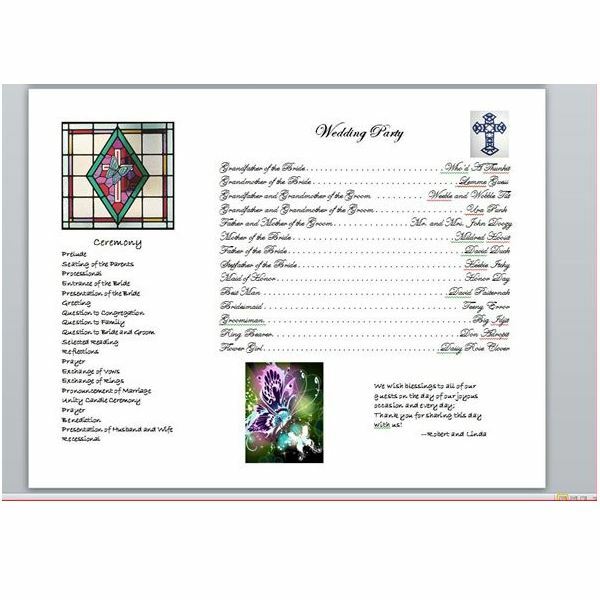 about anything in a wedding program: Most people start with the events of a wedding (processional and presentation of the bride, for example) and move on to name the cast of characters—everyone from the grandparents to the littlest flower girl. Still others choose to list specific musical selections chosen for the wedding and reception or offer remembrances of family members who have passed on. Turn your program into a keepsake that will last forever. 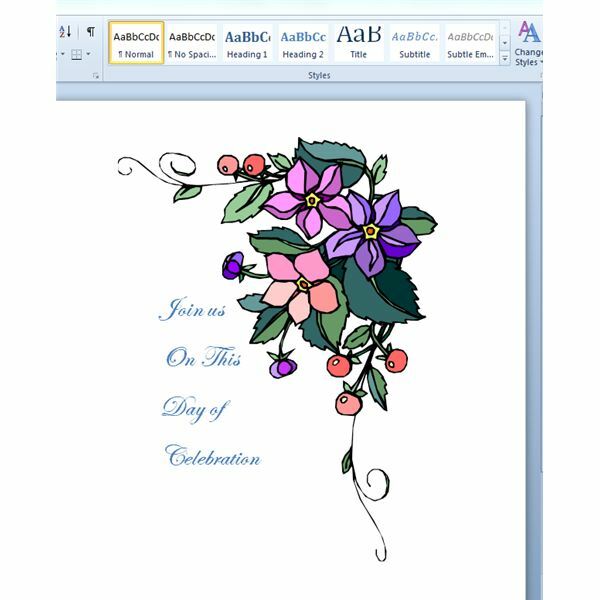 Besides a couple ideas for standard wedding programs using MS Word, you can make and decorate a multi-layered wedding program fan (decorate it with your floral motif! ); and we also have just the right quotes to express your feelings on this magical day. With a few simple DIY clicks of your desktop publishing mouse, you can embellish the tables at your reception with ingenious ideas for place cards, and why not design your very own wine bottle labels? Seed packets make great gifts for your guests, and they cost next to nothing when you make them from scratch and fill them with seeds that fit your floral theme. If you’re having a Monte Carlo theme, you can download playing cards from Publisher. The template here works with or without the playing card theme; what if you skip the cards and just use the template to make menu cards for your place settings? Or, put a plate of fortune cookies at each table, with lucky or romantic sayings in each, so your guests will have a little fun speculating about their own futures even as yours is unfolding. No wedding is complete without a guest book. Why not honor each guest with his or her own section in the book? There are many alternatives to traditional guest books. You can even begin well before you get to the guest book by starting a scrapbook, from the day of your engagement to the writing of the last thank-you notes.